These big hulks were bulky, expecsive, and finicky. They also provided a lot more flexibility than most users needed. So by the early seventies, everybody was making (and buying) pre-patched synthesizers. These were simply analog synths where the signal paths were preset in a musically useful way. This made it much easer for most users to create sounds, and cut prices dramatically. Modulars were dead. Today modulars have made a small comeback. There are a few modular softsynths, including a replica of the original Moog Modular. A few companies like Doepfer make good old fashioned analog module based units. But Clavia has taken a really interesting approach with their Nord Modular, straddling the line between hard and softsynth. Models must be created on a host computer, and uploaded to the synth. Once in the synth, the computer can be unplugged and the synth can played like and preset synth. 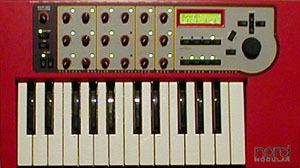 Some knob tweaking is available from the front panel to adjust sounds, but for the heavy duty work of adding/removing modules and recabling, the synth must be reconnected to the editor on the host computer. The complexity of designing a system like this is amazing, and the Nord really works. It's not like designing a prepatched synth. The system has to be prepared to behave intelligently even when the user doesn't, and makes some bizzarre patches. Nothing seems to phaze the Nord, and there are some pretty strange patches out there. Some synths have a strong user support network, for whatever reason. I can't imagine the Nord Modulars sold nearly as well as the Nord Leads, but the Modular community is huge. There are some 4 or 5 thousand patches downloadable on Clavia's website as well as ten or fifteen thousand other patches at various places on the net. There patches to emulate all the features of just about any synth made prior to 1983, including the DX7, Minimoog, and Arp 2600. You could play the Nord Modular as a preset synth for the rest of your life, and never lack for new sounds. There are several semi active mailing lists as well. It would be crazy to attempt to mirror all this, so I will instead just link. Clavia has recently released the Modular G2. They have more performance oriented featuresbetter keyboard, mod wheel, pitch bend. More powerful DSPs should up the maximum patch complexity. The editor software now communicates with the synth via USB which should increase reliability. But the best effect the new generation has had it to drop the prices of the first generation instruments to a bargin level. A G1 keyboard or rack can be had for around $500, and a Micro Modular can be had for around $200a steal. If you just want to noodle with building your own synths, I highly reccomend the Micro. It only has one DSP instead of four, but because of the way the Modulars handle DSP resources, it is capable of handling just as complex a patch as the bigger models, albiet with less polyphony. The downside to the original Nord Modulars is that Clavia has officially stopped further development and support for the instruments. Mac users have under gone two major OS transitions in the last few years: OS 9.x to OS X, and now PowerPC to Intel. Each move has had rudimentary compatibility steps (Classic and Rosetta), but it really has cleared out the backlog of unsupported software. Unfortunately, the Nord Modular editor never officially made the jump from OS 9.x to OS X. This would normally mean that, like the OasysPCI, a mac user would be required to keep an old system around for compatibility. Fortunately, the userbase was able to get Clavia to release an unfinished beta version of an OS X version. It has numerous known bugs and comes with no support at all, and no future versions, but it is stable enough to use in a studio (though probably not on stage.) One saving grace is due to the tight syncronization between the editor and the synth, if the editor crashes, you wont lose any work since the work is still in one of the slots of the synth. Just relaunch the editor and you are back to where you were when it crashed. While I have not tried, the beta reportedly runs well under Rosetta on Intel Macs. So far Clavia seems to be continuing to host files for their discontinued modular. For that reason, I won't mirror everything. Just a few key items. Nord Modular Patches  There are a list of patches on Clavia's web site that can be downloaded. Here I have just downloaded all their ZIP files and compressed them into a master ZIP file. Thee are lots of these as the Modular seems to have about the most active user community I've found. There is some duplication, as it is a very open and sharing community, with a strong prescence in the academic world. Clavia Old Nord Modular Pages  This seems to be an old set of pages on Clavia's site. There is some dupplication with the above link, but it has more content. Nord Modular Archives  Archive from a Nord Modular Mailing List. Includes thousands more patches, in depth lectures, FAQ and more. Highly reccomended. Though some programming glitch seems to output the content of pages twice. Nord Modular Electro Music List  The subscription page for the above list. Electro Music Forums  For those that prefer to keep their discussions out of their inbox and on a web page, the same group hosts forums. The forums seem to have more of a G2 bias. Nord Modular Yahoo Group  There is usually a Yahoo group for just about every synth. Nord Modular Things  Among other things, a utility to weed out duplicate patches, and a utility to generate .midinam files. Gehenna  A page with some more patches. nmedit  The beginnings of an open source Nord Modular editor. Nothing useable yet. Blue Hell  Jan Punter's site. Includes lots of windows based utilities, as well a patches and technical docs on the Modular. Advanced Programming Tecniques for Modular Synthesizers  This online book is done on a Nord Modular, but could be applicable to any modular type synth. It gets pretty deep.